This domain was originally found in the C-terminal moiety of the Cpl-7 lysozyme encoded by the Streptococcus pneumoniae bacteriophage Cp-7. It is assumed that these repeats represent cell wall binding motifs although no direct evidence has been obtained so far. 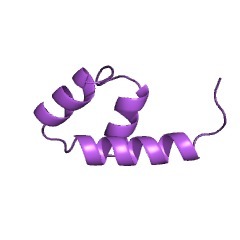 This domain was originally found in the C-terminal moiety of the Cp-7 lysin (lysozyme, P19385) encoded by Bacteriophage Cp-7 [(PUBMED:20720016)]. It is also found in the cell wall hydrolases of human and life-stock pathogens. CW_7 repeats make up a cell wall binding motif [(PUBMED:23056389)]. There are 968 Cpl-7 domains in 491 proteins in SMART's nrdb database. Taxonomic distribution of proteins containing Cpl-7 domain. This tree includes only several representative species. The complete taxonomic breakdown of all proteins with Cpl-7 domain is also avaliable. Click on the protein counts, or double click on taxonomic names to display all proteins containing Cpl-7 domain in the selected taxonomic class.